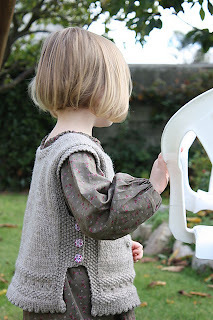 https://www.knitnscribble.com knitnscribble.com: Sweetest little girls vest is trés bien! Available in French or English with a whole slew of other charming children's patterns for girls and boys, the little vest can be worn as a warm apron of sorts to compliment dresses or blouses and pants. It's knit with a US size 8 (5 mm) needle, so it shouldn't take too much time. The best part, the knitting pattern is written for sizes 2 to 12 with cross-chest measurements of 32 - 42 cm. Read on for the vest pattern links to knit or to crochet. 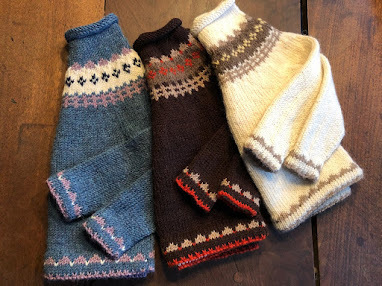 The website for both English and French versions of the pattern "Esprit Folk - le débardeur" is Cécile Levesque's "Les Tricots de Cecile." The pattern is available only in French on Ravelry. Knitting patterns are sold in Euros and this one with the exchange rate was only $4.11 through PayPal. The vest is buttoned on the sides with the front and back knitted as one piece, and there is a pocket option for the front. The pattern calls for 1 to 2 skeins of Cascade Ecological Wool (250 grams/437 meters). Trés bien, Cécile! 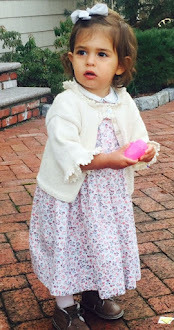 I knit Cecile's vest and combined it with a Minnie Mouse hat for our year-old granddaughter's birthday this past summer. The vest is one that will fit for a couple of years, well worth knitting. 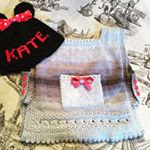 There's another little vest or waistcoat that's a favorite of knitnscribble, it's a free crochet pattern for baby up to 3 to 4 years, you'll find the link here.